Welcome to the latest entry in our Bonus Round series, wherein we tell you all about the new Android games of the day that we couldn't get to during our regular news rounds. Consider this a quick update for the dedicated gamers who can't wait for our bi-weekly roundups, and don't want to wade through a whole day's worth of news just to get their pixelated fix. Today we have a first-person casual dungeon crawler, a driving game where you destroy everything with a giant mace, another dungeon crawler with top-down shooter controls, a platform-shooter, a casual shake-sliding game, and one more bonus dungeon crawler. 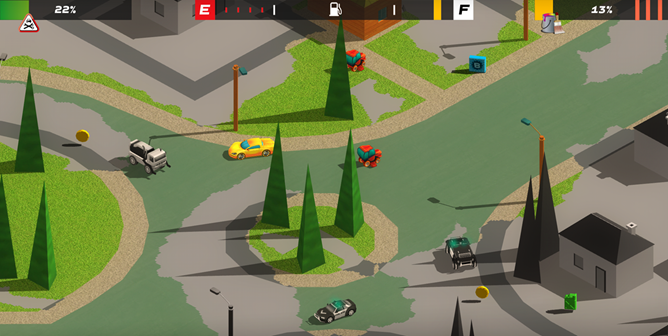 The Hit Car is a strange mash-up of super-simple games like Crossy Road and, well, running over zombies with a souped-up truck. If you want to play classic ports or new PC games on your phone or tablet, then April was definitely your month. Between the blockbuster adventure game Broken Age and classics like Ys, there's a lot of non-mobile goodness to go around. But don't worry: there are a few original games to investigate as well, notably Implosion and the third entry in the Sorcery series. Here in no particular order are our top picks, along with some honorable mentions. Broken Age is probably the most anticipated adventure game in years, at least for enthusiasts, after celebrity developer Tim Schaefer's record-breaking Kickstarter campaign. If you combine the basics of Dig Dug and the free-tapping gameplay of the Where's My Water series, you might get something very much like Micro Miners.